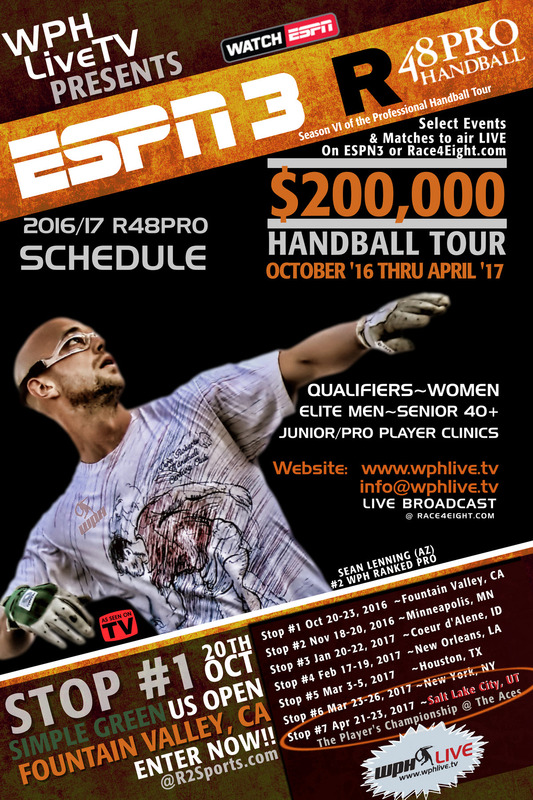 Jan 27th, 2016, WPH Press- Season Six of the WPH Race4Eight Professional Handball Tour is set and marks the third continuous season with ESPN3 & WatchESPN App. The 2016/17 tour will feature seven stops, one new location and a couple familiar locales moving to different months. The Tour will highlight Qualifiers, Women’s Pro, 40+Senior’s best, Elite Eight Men and more! The WPH allows ANYONE to enter all season long, to include the Player’s Championship. The Tour will begin in October of 2016 and run until April of 2017. All qualifier matches will play with the R48Pro Ball & one game to 25 format; qualifier matches begin at 9am on Friday morning at all stops except the US Open (Open format), Plummer Bash (Open) and New York; Qualifier begins at 2pm on Thursday in the Big Apple. All Senior 40+ stops will be played with the R48Pro Ball & one game to 25 format; Men’s main draw (16’s) will be played using the 15, 15, 15 win by two format; meanwhile, the WPH Elite will use the R48Pro Ball. WPH Elite Men’s playoffs will follow the 25 point game format. Women’s Elite will play best two out of three to 15, win by two and will use the USHA Red 21 ball.